Today is a big day! Not only is it the first day of Spring, but it marks 6 years since the day I bought Edna and the one year mark of our Two+ Year North American Tour. According to plan, we’ve been traveling at a comfortable pace – sometimes fast, sometimes slow; visiting many new communities, as well as familiar ones; and making tea at all types of places – from the Pacific Crest Trail to Hollywood Blvd. Planting a tree in front of the Giving Garden in Santa Monica, CA. In the first few months of this tour we struggled with finding the balance of no plans, but seeking to accomplish things as well. And finally, I believe, we have found this. Since leaving the more familiar North West Coast, we’ve been graced with many opportunities to sink or swim with the ebb and flow of our adventures. The harshness of the big city environment of Los Angeles (endless parking meters, anti-camping laws, no biodiesel, etc.) gave us an opportunity to swim against the current. And we made it out alive. Just 5 years ago, Los Angeles was an easier beast for us. What happened? Are we softer for our time spent in easier communities? Did LA change? Some of our certain parking spots were gone, leaving us with harder guerilla camping and higher dependency on friends, new and old. 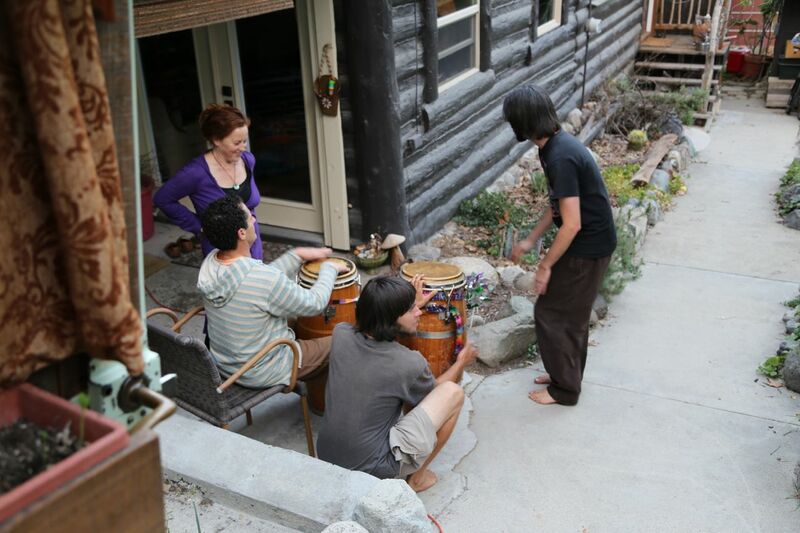 In the midst of this, however, we continued to make tea for folks, find and participate in beautiful communities, and figure out where we could take a rest. A whole crew of wonderful folks on Abbot Kinney in Venice Beach, CA. Our trip since Winter Solstice brought us down from Nevada City, through the central valley of California, into Ojai for a stint, and on to Los Angeles. For much of the beginning of this trip, my dear friend Ally accompanied us, bringing her own vibe to the journey and tea parties. We went back to Hollywood Blvd – the place where it all started. We relearned the city, driving the old roads, finding new ones. We took rest in the shade of the trees of Griffith Park, and made a trek to visit my grandparents. In between our trip down to Laguna Beach for the Terra Vita Herbalism Symposium, we stopped places like Costa Mesa, Harbor City, San Pedro, Monrovia, Pasadena, Venice Beach, Santa Monica, and more. Each of these places offered a different experience. 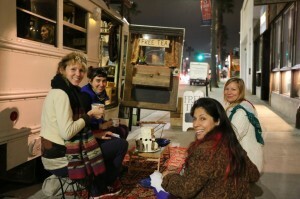 In Venice, we made tea on Abbot Kinney for a wonderful crowd. 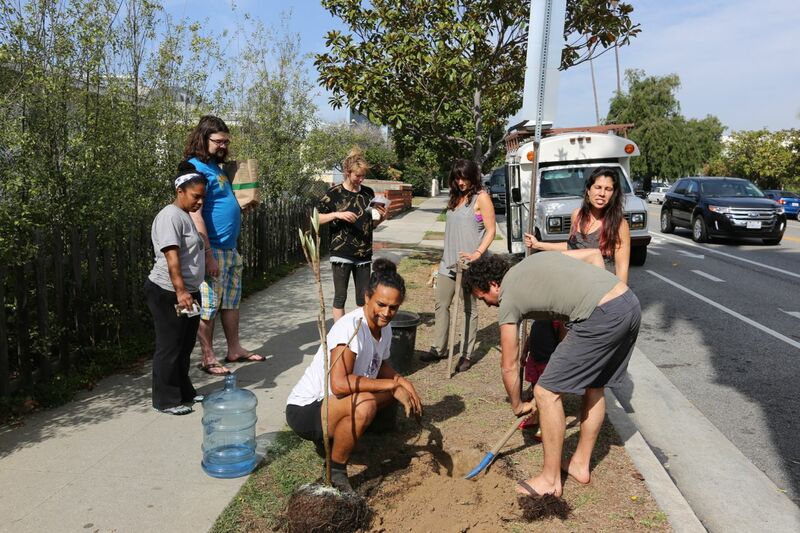 In Santa Monica, we participated in a wonderful community called the Giving Garden, where we connected with some wonderful folks and lent a hand at (trying) to fix some things. Students at the Anneliese School in Laguna Canyon, CA. At the Terra Vita Herbalism Symposium, we were invited to stay one extra day at the Anneliese School by some of the school’s directors in order to spend some time with the 5th and 6th graders. And boy, what a blast! After gathering all the 5th and 6th graders into one classroom (about 30 of them), I started sharing about what I do with the tea bus. There were lots of words like whoa and cool floating around the classroom. And 6 by 6, we went out to the bus for tea. 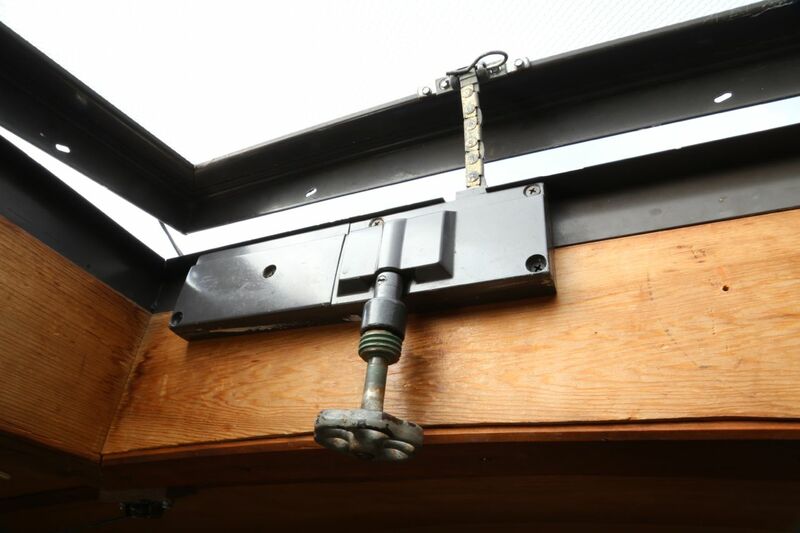 I told them about and showed them some of the cool things, like the solar electric system, waste vegetable oil system, wood stove, hot water heated by waste engine heat, etc. Afterwards we gathered back in the classroom for some Q&A. I was blown away by how interested the students were. Many of them spent their recess with me and they invited me to share lunch with them. 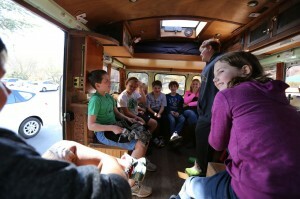 Afterwards, the 5th graders and their sweet teacher spent part of their class in Edna playing mystery games. Other than the heart-warming but silly request of many of the students for an autograph, the kindest gift was from a student named Drew, who made a Magic (the Gathering) card with a picture of me on it, cup of tea in hand, and Edna in the background (50/50 creature, one forest manna to summon, He uses tea for fun. He gives free tea and is super EPIC). 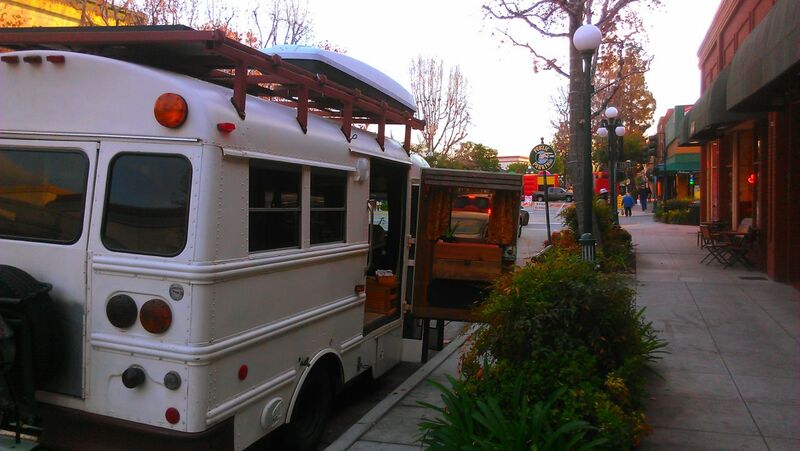 Tea time in Monrovia, CA for their Friday Night Festival. 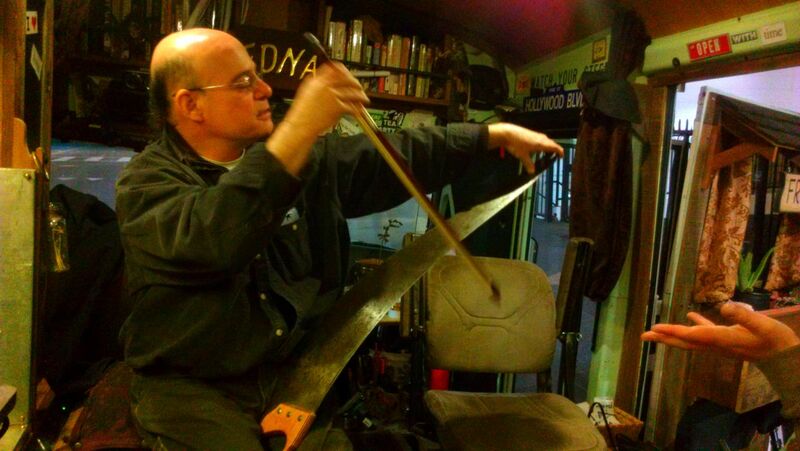 My dear friend Edward (who taught me to weld, and helped build my roof rack when I first bought Edna) suggested I head out one of these Fridays to Monrovia for their weekly Friday Night Festival – a street fair with music, food, and art. Having a love for these kinds of events, I couldn’t resist. 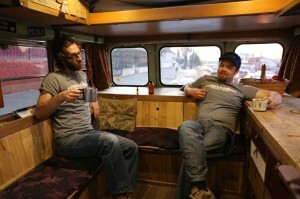 Immediately upon arrival, a charismatic fellow named Jeremy took a liking to the bus. Instant buddy! 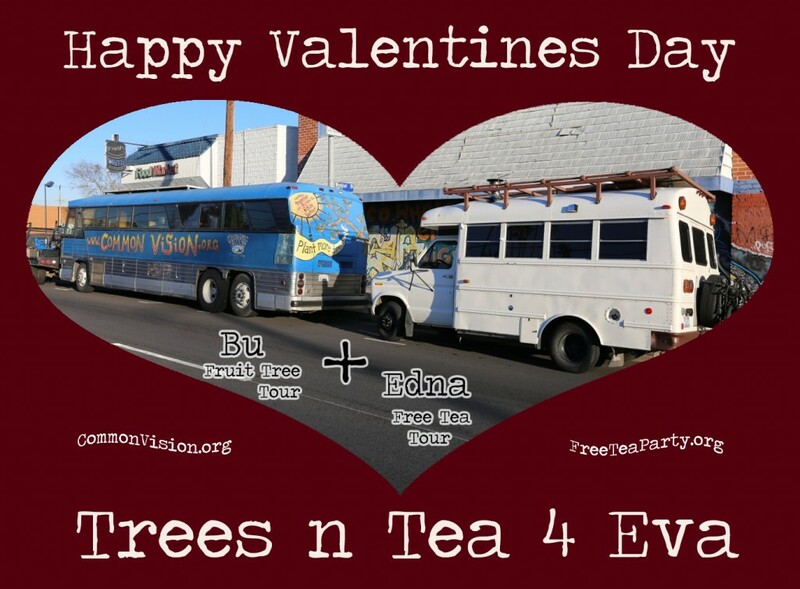 And upon asking, the local board shop welcomed the tea bus to park out front, and even put out a message on their networks for folks to come on down and get some free tea. I get gifted a massage for all my hard tea serving work. What started as a slow evening became an amazing night with a group of young adults who call themselves “The Family.” Self-described social outcasts, this group has created their own community that has flourished, reaching numbers in the 30s or 40s at times, though there are core members who help stitch the crew together. 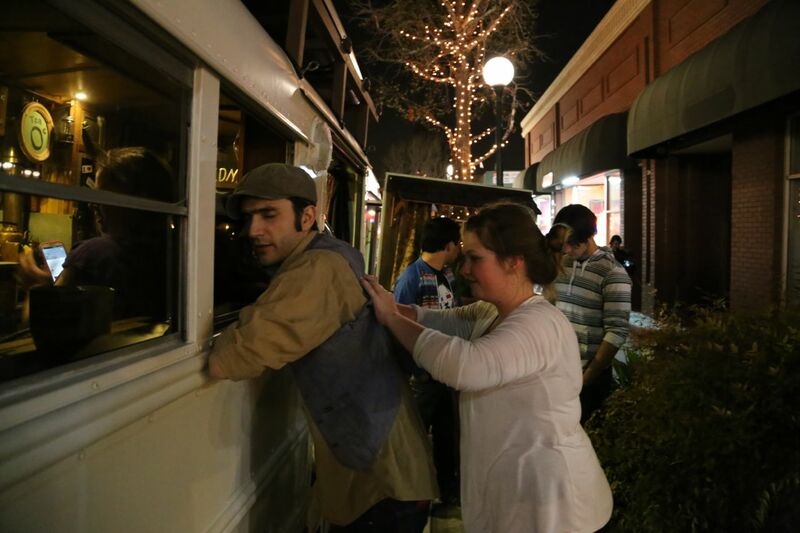 The Friday Night Festival has served as their meeting place, and brings them out each week. 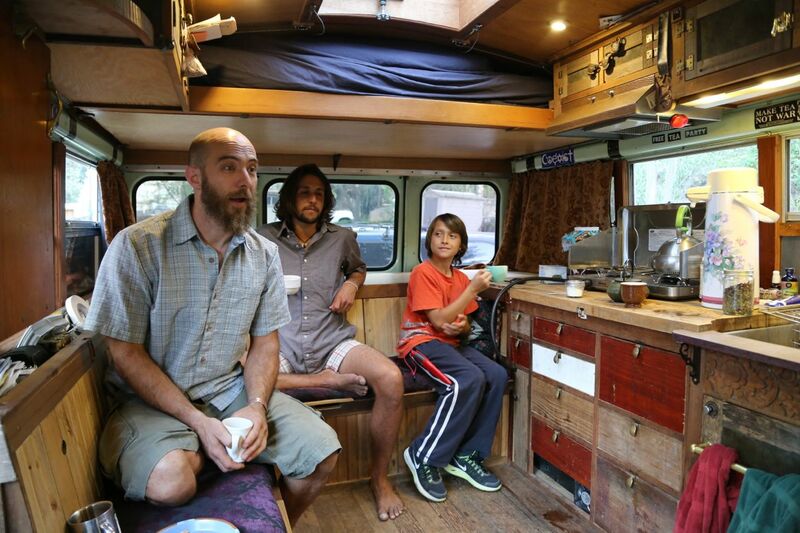 Stumbling upon the tea bus, they couldn’t help but get drawn so deeply in to the concept, construction, and lifestyle behind it all. 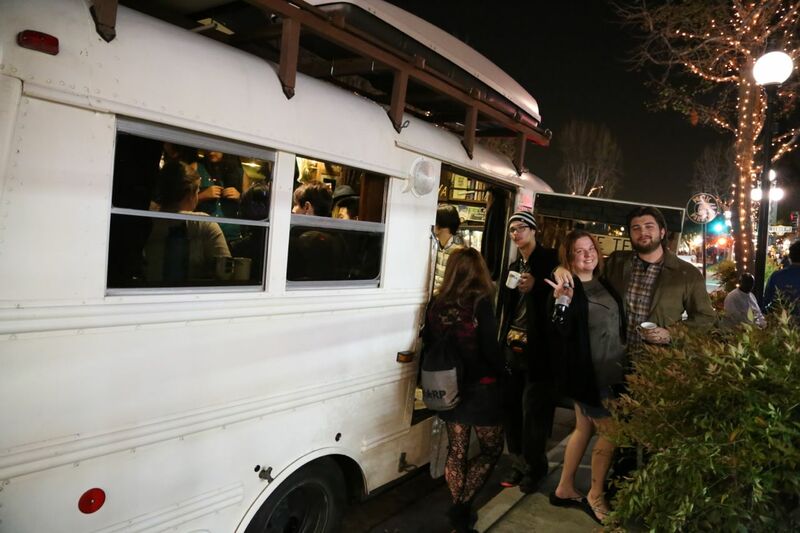 By the end of the night, with many questions asked, many cups of tea drunk, and a bunch of happy folks, they had decided on potentially purchasing their own bus – figuring out who would be the mechanic, who would build things, etc. We arrived back in Monrovia a few weeks later for another Friday event. Again, what started slow turned into another beautiful night. 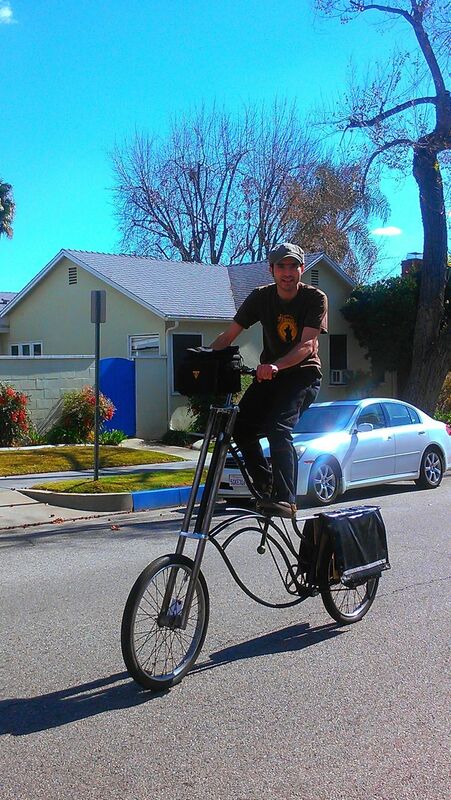 Myself riding one of Edwards Frankenbikes. 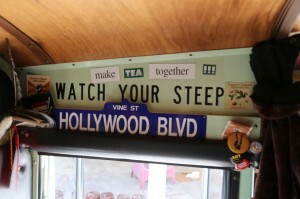 Amongst our Monrovia street adventures, we spent time at the house Edward and his wife, Robin. They welcomed us to park out front, offered food and showers, fresh homegrown produce and avocados, and even let me work on a wood-working project in his shop – the build-out of my Gift and Take area (blog entry on this to come). I have to say, that after much time apart, true friends are ones as such. Edward was just as excited to be a part of the tea bus’ evolution this time around as he was 5+ years ago. We jive wonderfully and tend to bounce creative ideas off each other. 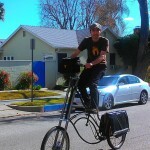 A burner, bike Frankensteiner, and a builder… A true gem! Amongst the journeys around So Cal, we were invited to come and participate with one of our favorite organizations. We love Common Vision because they are the world’s largest vegetable-oil-powered caravan, planting fruit trees at schools with kids. In the past, I’ve been on tour with, and worked on many video projects for them. This time around I created a fun little 3-minute video to highlight their orchards as living classrooms. 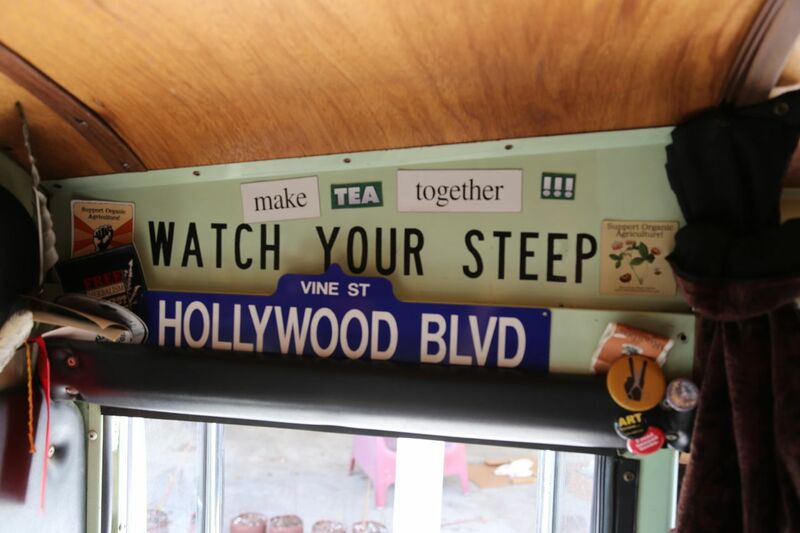 In between all the work, I was able to be part of this community, sharing space, food, and several tea parties with all the good folks traveling on the bus, and living at the Sugar Shack – the LA home base for Common Vision. Love you guys! Common Vision’s bus, Bu, and Edna Lu. 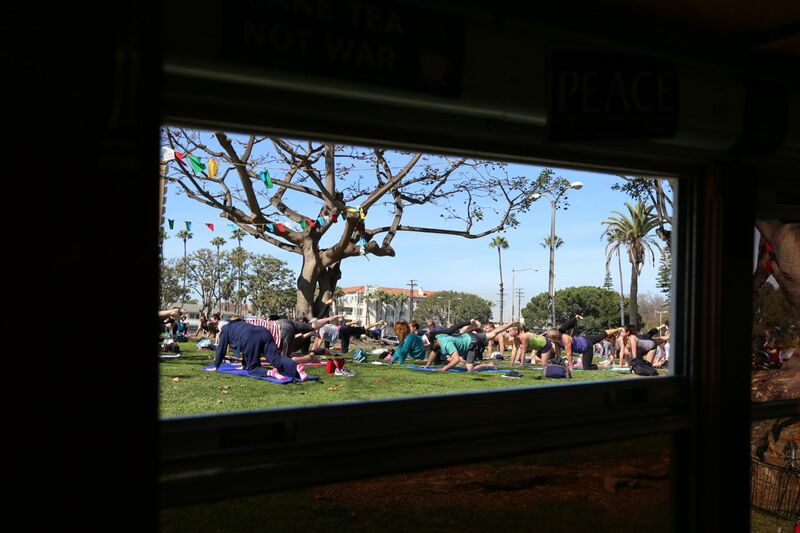 In Long Beach, where we stopped a few times, we served tea multiple times at the FREE YOGA that takes place on the bluff every day. Inspired to create larger access for an often-pricey class, Dharma started teaching free yoga on the bluff. What started small grew quite large and serves up to 70 or so folks on the weekends. It was a pleasure to meet many of these folks, and especially Dharma and Radharani – both of them instructors. When I served there on a weekend, it was so busy I had a line more than 30 people long. I couldn’t make tea fast enough – especially since I was making iced tea! Thank you for providing a gift for the community! 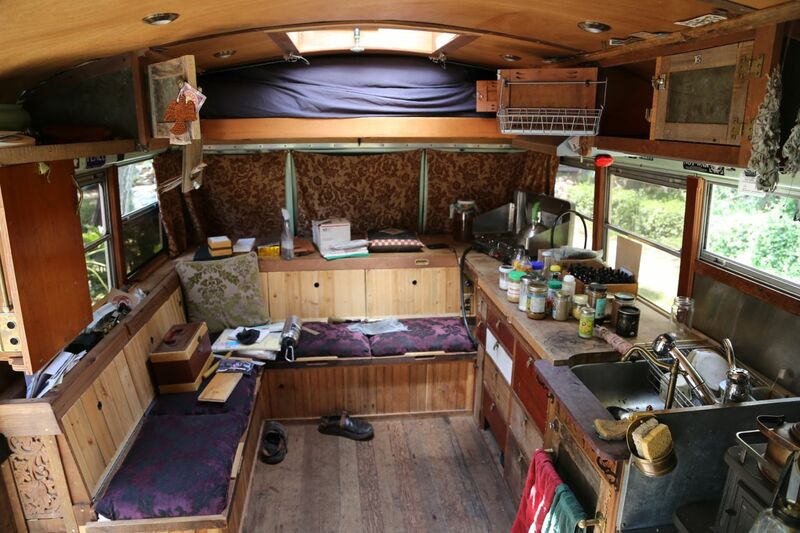 It is amazing to see other projects similar to the tea bus out there. 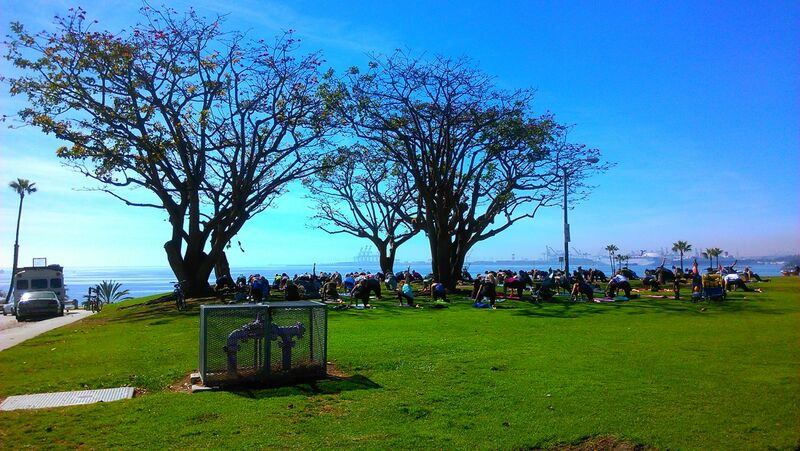 Free Yoga on the bluff. On a Tuesday, we served tea at Long Beach’s Bixby Park Farmers’ Market. We pulled up to the side of the park and opened our doors, only to hear from our new friend Arturo (from Communitea Culture) that the health inspector was there. I hesitated leaving the FREE TEA sign out. I decided that an interaction with a health official was something that I needed to experience. With the steady stream of people coming in to the bus, I kept my eye out for the inspector (scanning for a clipboard). As I was chatting with a guest, he appeared. 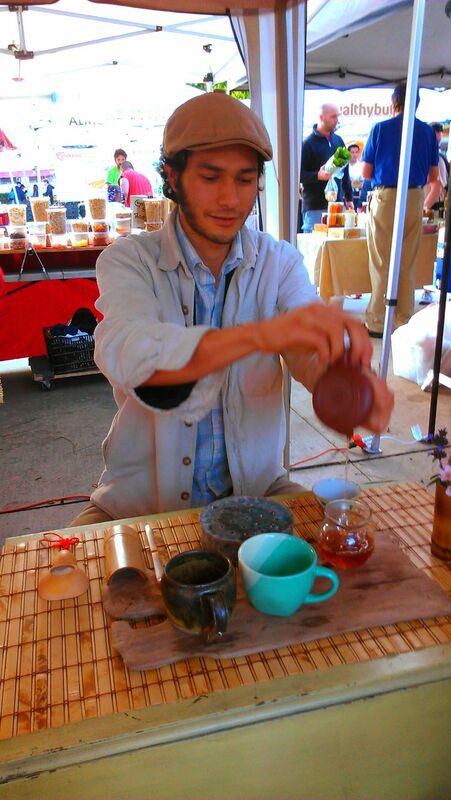 Arturo of Communitea Culture in Long Beach pours tea at the Farmer’s Market. Do you have a health permit for this? I didn’t know I needed one for making friends and inviting them into my house for tea! He was a very reasonable man, but still wanted me to shut down. I assured him throughout our conversation that I was taking my signs down, but that I wanted to know what law said I needed a permit. As I understood it, California Retail Food Code (CalCode) stated very clearly that “private homes” were not, indeed, Food Establishments, and therefore did not require a health permit. 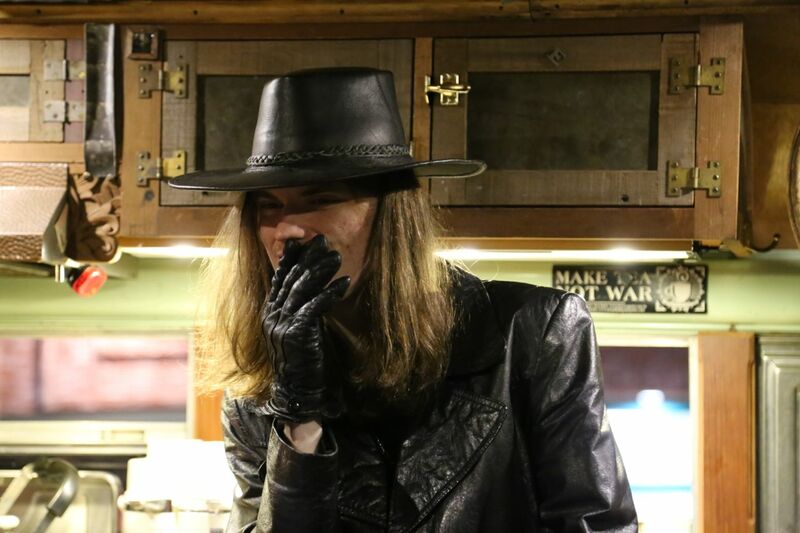 He said that signs offering tea to strangers made it public, but that I should come down to the health department and chat with them, as this was not an end-all-be-all circumstance. I obliged, and shut down. 114381. (a) A food facility shall not be open for business without a valid permit. 113789 (c) “Food facility” does not include any of the following: (2) A private home. 113758 (6) “Private home” means a dwelling, including an apartment or other leased space, where individuals reside. Project time in Harbor City at Jon’s. It seems pretty straight forward to me… What I do, does not require a health permit in the State of California, unless county or city law says otherwise. I could not find any law for the City of Long Beach that does… I was hoping to get a chance to stop by the Long Beach Health Department on my way back through, but didn’t get a chance. On our way through, we stopped in Harbor City twice, where my good college friend Jon bought a house. This provided us with a perfect place to home-base ourselves. Jon, working 65 hours a week as a lawyer, had written months ago wanting to bring more things into his life like serving free tea and planting fruit trees. And so I came! His big vision includes creating a community space for town hall meetings, and free legal advice on weekends. 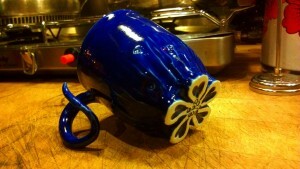 Gifted tea cup at San Pedro Art Walk. Our first evening together, we took a drive just down the road to San Pedro’s monthly art walk. I convinced him to keep the suit on he had been wearing for court, and I put on mine – tie and all – to go serve tea in. A rare rainy evening made it slow. But often that can bring a deeper sense of genuineness to tea parties. People who come in are likely to stay longer, sip more tea, and connect better with the fewer people who are there. 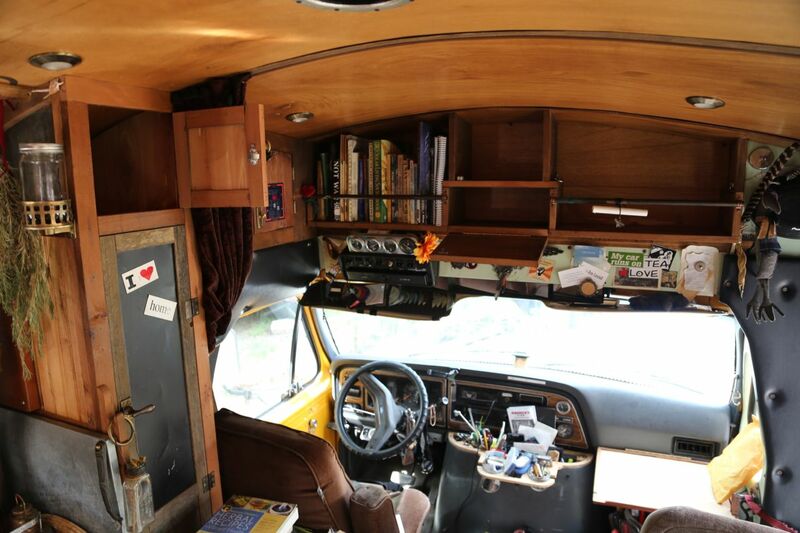 We met a couple who had built a sauna in a trailer, some high-schoolers, and more. A kind woman who makes amazing teacups offered us one as a token of appreciation. 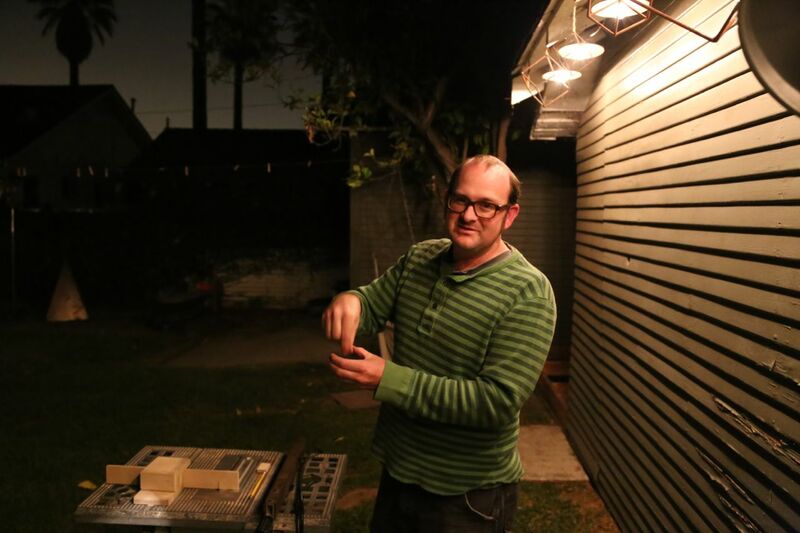 When I arrived back in Harbor City a couple weeks later, I set up shop in Jon’s back parking area. 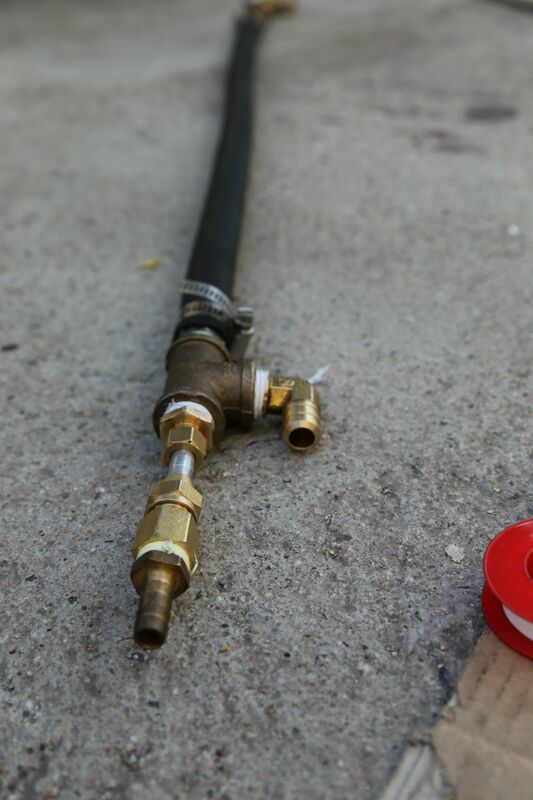 It was perfect to do some tinkering with my waste vegetable oil system… There was cement, power, a roof to store some tools and parts under, and a good friend who needed a hand with a few things. 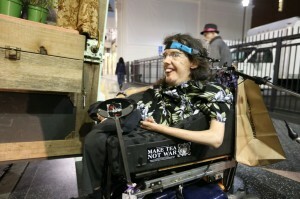 During this time, Ally came back down for a short visit before her big trip across the nation. A true friend Ally has become, and like her namesake, she has become an amazing ally. 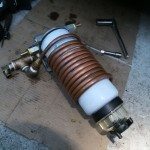 The new WVO filter (coolant wrapped). 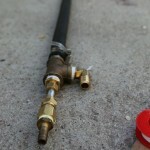 The new Hose-in-hose (HIH) WVO heating setup. 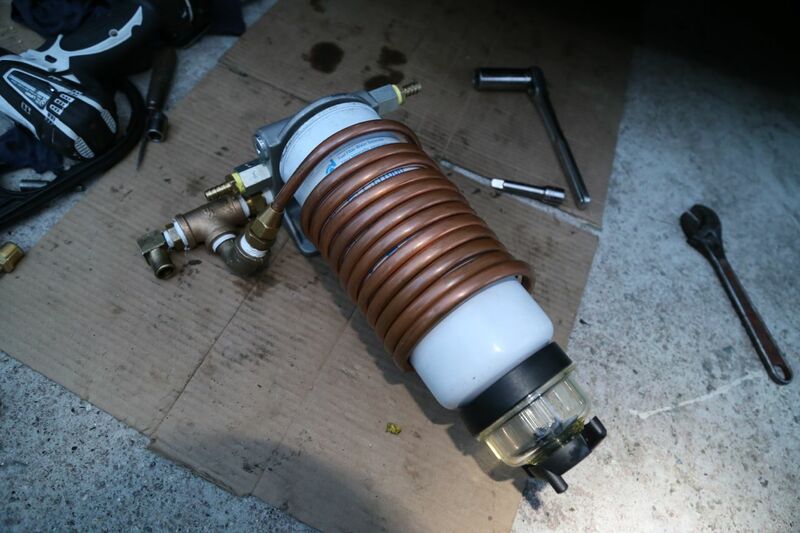 The few projects I was attempting (building and installing a new WVO filter and hose-in-hose setup, up-sizing the hose that feeds my centrifuge, replumbing my clean WVO to include its own pump, etc) couldn’t take more that three days, or so I thought. 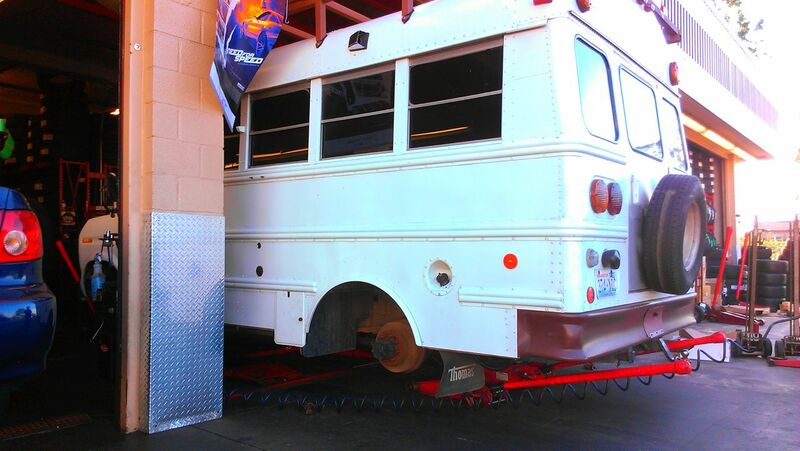 I ended up underneath my bus for a week and a half, with everything going wrong that possibly could. Phew, that was exhausting. 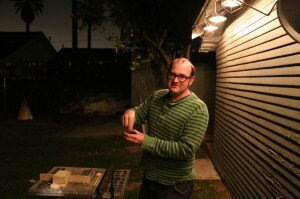 A HUGE thanks to Jon for letting me work on these projects at his house. What a bro! 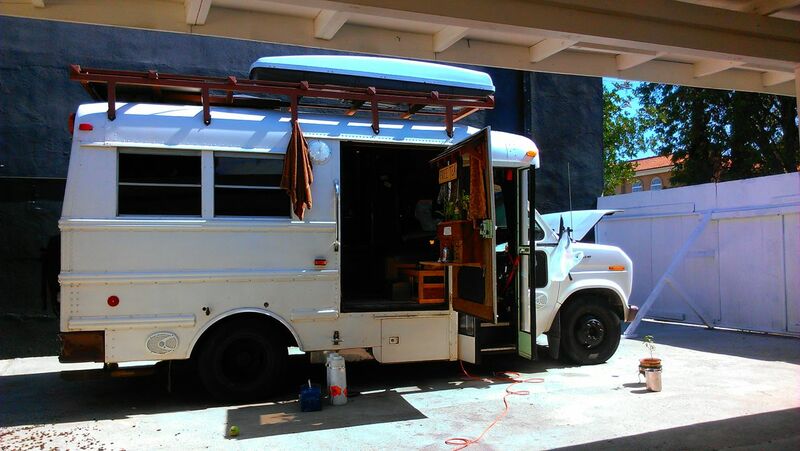 Now we reside in Trobuco Canyon – a wonderful sanctuary amongst the madness of Orange County. I’m here to make a couple short films for an awesome nature-based educational non-profit called EarthRoots Field School. It’s been a blessing to be brought into a community of wonderful folks, to a place I can call home, even if briefly, to share meals and land. Thank you, Jodi, Adam, and Willow! On the full moon Edna and I crept out to the beach for a full moon drum circle, which was a blast! 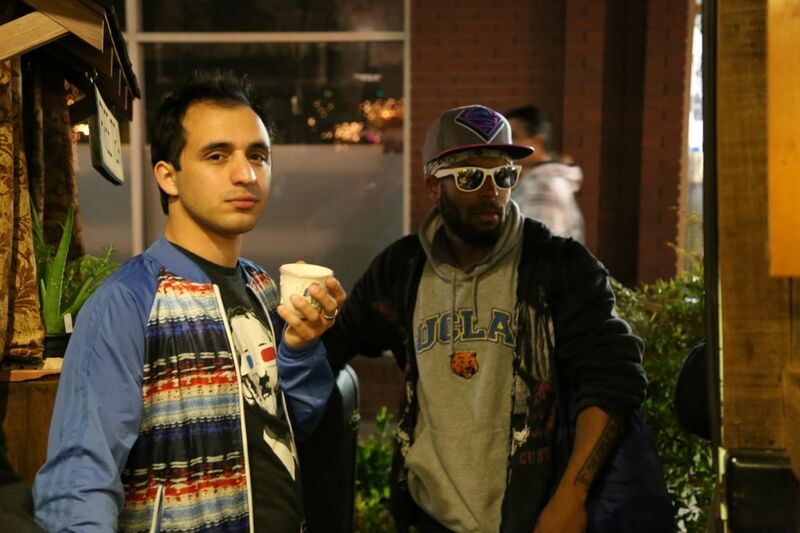 Alan, Julian, and Lucas at our equinox celebration. Today was a wonderful day. I got to sleep in for the first time in a while, so it was nice to be warm and snuggley inside Edna for a couple extra hours. 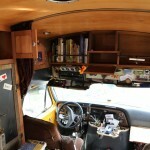 Once I finally roused, I spent the day giving Edna love in the form of Spring cleaning on her inside – starting at the top, and working my way down. I only got to window level, but I’ll continue to clean her over the next week while I’m here in Trobuco Canyon editing. In the evening we had a potluck/equinox gathering here at Jodi, Adam, Willow, and Alan’s place with just 10 or 15 people. Tea, food, fire, story-telling – a wonderful way to spend the first day of Spring, and Edna’s (re)birthday. 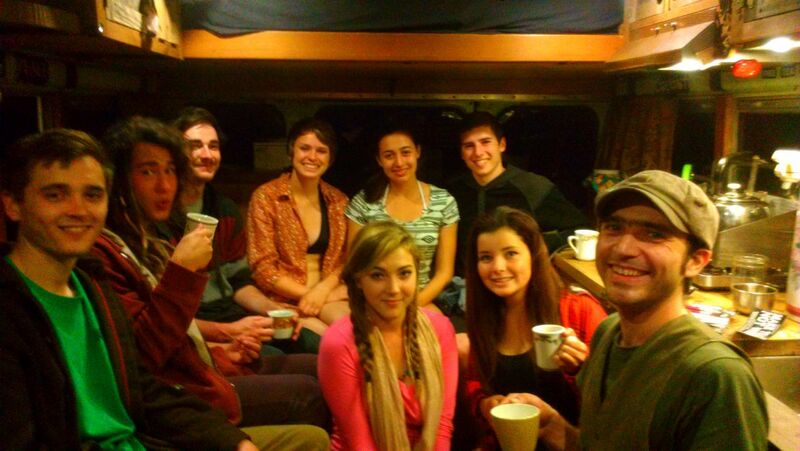 Here’s to the more years to come of tea tour! Some equinox drumming next to the bus. Our plan from here is to take our time to get to Arizona and New Mexico. 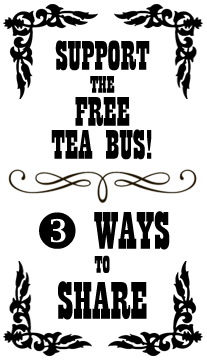 Know a place we should visit, or people we should see there? Let us know! A big shout out and thanks to Califa and Jed in Silverlake, Gidget and the whole Giving Garden Community in Santa Monica, Jim and his whole house in Echo Park, The Leeds Family in Laguna Canyon, Chris Prelitz and Theresa in Laguna Beach, everyone at the Anneliese School in Laguna Canyon, The Sugar Shack in Mid-Town Los Angeles, my family with Common Vision on the road, Misty in Hollywood, Egon in Hollywood Village, Edward and Robin in Monrovia, David in South Pasadena, Side Street Projects in Pasadena, Ude and Blue in Harbor City, Dharma and Radharani with Free Yoga, Arturo and Anna of Communitea Culture in Long Beach, and Jodi, Willow, and Adam in Trobuco Canyon. New skylight knob made from an old spigot handle that Edward gave me. Some reminders every time I walk out the door. I love all these! Edwards shares some words of wisdom on something – probably something very important. 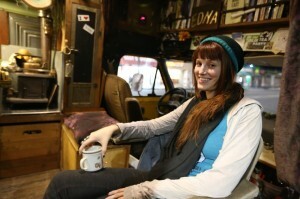 There’s always lots of interesting characters on the tea bus. Two tea guests in Monrovia, CA. Some of “The Family” at the Friday Night Festival in Monrovia, CA. Misty sips tea on Hollywood Blvd. 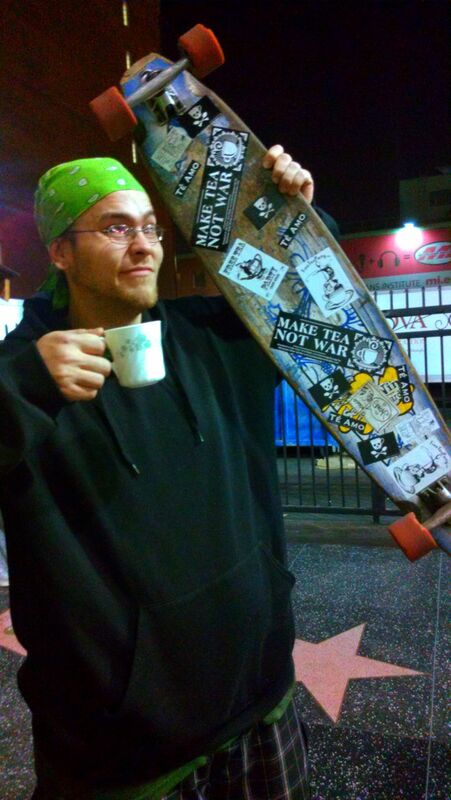 Christian, a traveler from Germany, rocks the Make Tea Not War sticker. 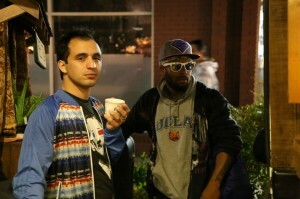 Michael and Leo of Common Vision sipping some tea in Mid-Town Los Angeles. My grandfather, Joseph, with his Model A. 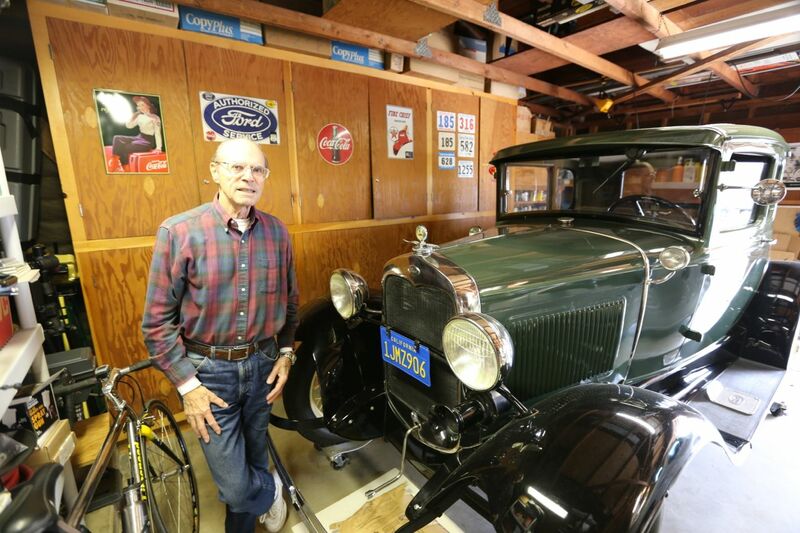 Perhaps this is where I get some of my tinkering from. Free yoga on the bluff in Long Beach, CA. 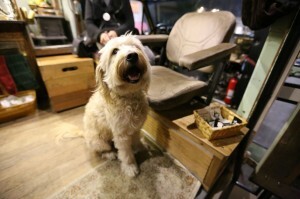 Even the pup enjoys the tea bus. Venice Beach, CA. 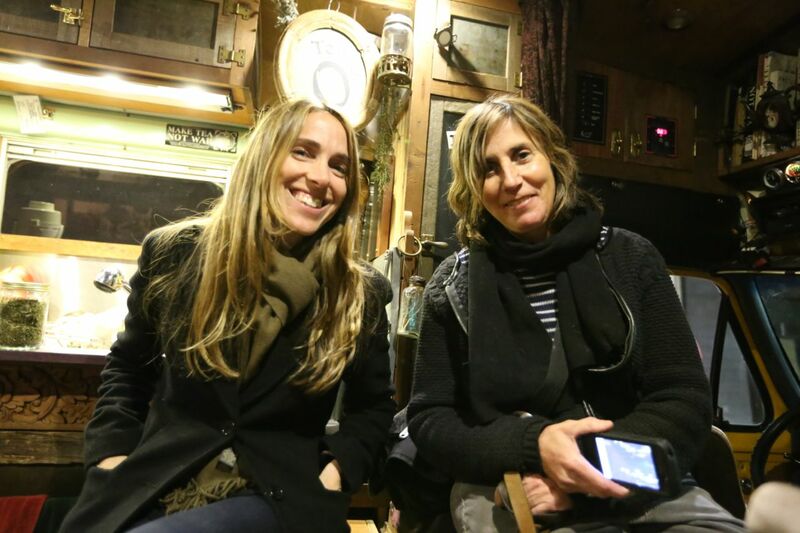 Two wonderful tea guests in Venice Beach, CA. 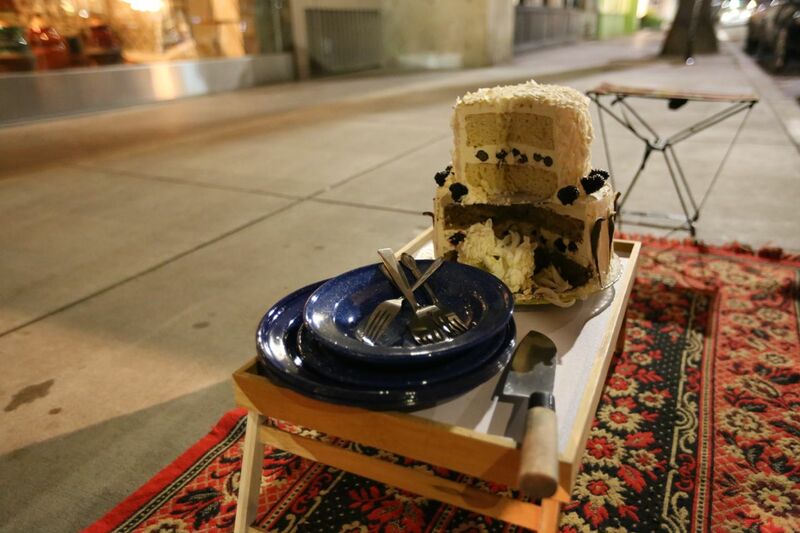 Gidget brought cake to share on Abbot Kinney in Venice Beach, CA. Tea Time at the the Full Moon drum circle at Aliso Creek Beach. Egon plays ‘Somewhere Over the Rainbow” on Hollywood Blvd. New tires in Mission Viejo, CA. Old-school tea sipper Lunch Box from 8 years ago comes back for some tea. This entry was posted in Events, Journeys, News, On the Street and tagged Abbot Kinney, Anneliese School, art walk, CA, Common Vision, community, Costa Mesa, drum circle, EarthRoots Field School, elementary school, Farmers' Market, Free Yoga, Friday Night Festival, full moon, Gift and Take, Giving Garden, Harbor City, health inspector, health permit, Hollywood, Hollywood Bl, Long Beach, Los Angeles, Monrovia, North American Tea Tour, Ojai, Orange County, Pacific Crest Trail, Pasadena, San Pedro, Santa Monica, spring cleaning, street fair, Sugar Shack, TerraVita Herbal Symposium, Trabuco Canyon, Venice Beach, WVO. Bookmark the permalink. Guisepi, Perhaps the next time a health official invites you down to headquarters, you could in turn suggest they come to your place, serve them some tea, and discuss Ca. law. It is my understanding, the primary purpose of any law, is to do the right thing for all parties involved. They might even invite you back merely for enlightening them of how the law is supposed to work. I hope Edna is enjoying her new shoes she got for her birthday. You certainly treat her well, as you do with all her company as well. Art’s alive isn’t the same without her, that’s for sure.